I received this link from a reader yesterday, which explains how Vibram USA Inc and Vibram FiveFingers LLC are part of a lawsuit where it is being alleged that they made “deceptive and misleading statements about the benefits of barefoot running”. It is alleged that the company, which makes the now famous Five-Finger shoe (pic on the right) have made deceptive claims about their health benefits, and this is leading to increased injuries among runners who make the switch. There is even some research as part of the lawsuit – the American Council of Exercise is carrying a report of this study, which finds that many people who make the switch continue to land on their heel. Why is this potentially bad? 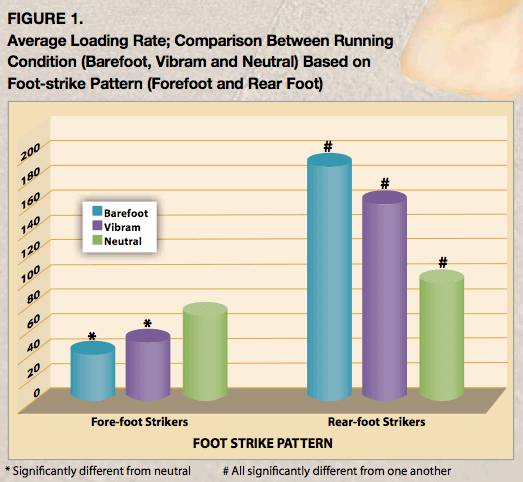 Well, the graph below, taken from a study on the ACE website, shows the loading rate in three conditions – barefoot (blue column), in Vibrams (purple) and in normal running shoes (green). What should be immediately clear is that when you look at runners who land on the forefoot (shown by the cluster on the left) the loading rate is lowest when barefoot and highest when forefoot. However, when you look at runners who land on the heel (right cluster), their loading rate goes in the other direction – here, the barefoot runners who heel strike have loading rates that are about double those of shod runners who are landing on the heel. This is the effect of the big cushion under the heel of modern running shoes, and it serves to dampen the impact and reduce the loading rate significantly. 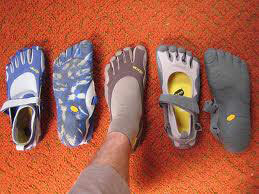 Vibrams lack this cushioning, on so fare only marginally better than the pure barefoot condition in heel-strikers. Those of you who have followed this barefoot running debate will immediately recognize that this finding of impact force differences is not new at all. In fact, it was found by Daniel Lieberman in a paper published in Nature about 2 years ago. Lieberman’s differences were even more striking – he found that if you run barefoot and land on the heel, then your impact forces are seven times higher than if you land on the heel in shoes. The graph below is one that I redrew using Lieberman’s data and put on this website when I reviewed the barefoot running phenomenon last year. Now, having said all this, it’s important to find the balanced, evidence-based view and be transparent about some “limitations” in these studies. The first is that the link between loading rates and injuries is not as tight as many would think. Certainly, higher loading rates have been associated with certain conditions (bone stress injuries being the main one), but the precise aetiology of how injury develops is far more complex than simply saying “if you reduce loading rate, you won’t get injured”. Truth is, you might just get a different injury, especially if you start running on the forefoot because you see these graphs! Then secondly, I’d like to see the study above published in a peer-reviewed journal, only to see the methods in a bit more detail. Lieberman found a pretty large difference (7-fold) whereas the latest study finds a 2-fold difference between shod and barefoot runners when heel-striking. That, plus the exact percentage of runners who continue to heel-strike, as well the ‘training’ they did for the two-week training period, would be of interest to me in order to understand exactly what is being measured in the laboratory. 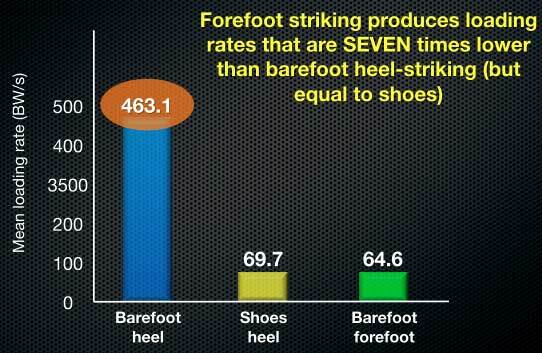 On that note, Lieberman found that 83% of habitually shod runners were still heel-striking when barefoot. The ACE study is saying 50% are still heel-striking, even two weeks into running with the minimalist shoes. Now, that flies in the face of the popular literature, which tells us that when you run barefoot, you switch automatically to an apparently amazing cushioned forefoot running style. That doesn’t seem to happen, though, and the vast majority of people seem to take a lot longer to make this transition than the books (Born to Run is the main one) suggest. In fact, I believe this leads to the most intriguing question of all – understanding the skill of barefoot running. The ACE study, mentioned above, had the runners do a 2-week “familiarization” period in the Vibrams, where they were asked to run for 20 minutes a day in an attempt to get them accustomed to it. It’s easy to criticize this period as too short and insufficient (all the stuff those who’ve already made up their mind can say – no study is perfect, remember). But this two-week adaptation period may partly explain why Lieberman found that 83% of his shod runners were heel-striking when barefoot, whereas the ACE study found that “approximately half” were heel-striking. Perhaps two weeks of familiarization was responsible for the shift of more runners (1 in 2 rather than 1 in 6) to a forefoot strike, as they ‘learned’ how to run. The real question, however, is why the other 50% didn’t make this adaptation? And whether they would given more time? Are there some runners who would never succeed? Who are they, and what distinguishes them from those who do succeed? I strongly suspect that some people CANNOT adapt to barefoot running, that they don’t have the necessary “skill” to improve the way they run barefoot and change what is years of shod-running-induced motor patterns. Of course, this is an unanswered question, but I think it’s the most important one that needs to be answered right now. Just as one would not expect anyone who picks up a tennis racquet or a golf club to even become competent at playing it (especially later in life), I don’t think it should be expected that simply making the transition to barefoot running will be sufficient either. Everyone can improve, certainly. But can they good enough to overcome or avoid what are some pretty clear “risks” associated with the transition? Remember, in running, unlike tennis or golf, it’s not good enough to simply improve over time, because if you don’t improve enough, you get injured, so there is a “minimum required improvement” to make the transition to barefoot or minimalist running viable in the first place. Here, one can begin to introduce the concept of coaching, that barefoot running (or any running, for that matter) should be taught as a skill. And certainly, this would help. In the same way that my tennis or golf game will improve faster if I’m guided, running ability will too. However, I don’t think this will overcome what, for some people, may be a “skill deficit” that will prevent them from succeeding at barefoot or minimalist running. Again, this is an unanswered question, at least for now. The other issue, which I raised above, is that there is substantial risk associated with making any change in running technique. This distinguishes running from, say golf, where wrong technique means lots of lost balls and frustration. In running, failure to find that apparently elusive “correct running technique” equals disaster. And what makes it even more tricky is that there’s no feedback until the injury – unless you have fancy high speed cameras and force plates to analyse how you run, the first sign of the mistake is often injury. So if you are going to advocate that people should run barefoot and then coach them so that they learn the right way to do it, then you’d better be certain that you’ll make them good enough to avoid the risk – there is a minimum threshold, and if a runner fails to reach it, you’ve led them to injury, despite good intentions. And it’s not fair to runners to say “Run barefoot” and then blame the runner for their failures. To illustrate this, the one thing that many will take out of this study is that it’s the forefoot landing that will make the difference. That is, if you land on the forefoot, you’ll be fine. And in theory, this is borne out by the evidence shown in the two graphs above. However, in reality, it’s a little more complex. One of the authors of this ACE study is quoted as saying “Buying these Vibrams and continuing to land your heels is probably worse than wearing shoes because the Vibrams don’t have any cushioning. … People may need very explicit instruction and time spent practicing how to land on the ball of the foot. Otherwise, they may be doing themselves more harm”. I think this is advice is probably MORE DANGEROUS than not saying anything, because as soon as you give an explicit instruction, you put the runner into the compromised situation where they are now focused on a forefoot landing. How do this achieve this? They planar flex – point the toe away from their body, and drop more than three times their body weight down onto a contracted calf muscle in a compromised shortened position, about 400 times every kilometer. That’s a recipe for disaster, and so the most common problem associated with barefoot running is Achilles and calf related injuries. Therefore, you can’t “instruct” a runner to avoid the risk. If anything, you instruct them into risk. Bad idea. The key, I believe, is to let the skill be acquired gradually, using a few drills to guide the athlete without ever changing their technique “manually”, so to speak. But here again, nobody really knows what works and what doesn’t. We don’t even know what constitutes “good technique”, and so to simplify it down to which part of the foot hits the ground first is also wrong. And that’s why it’s reckless to advocate anything. At this stage, everyone is learning, and so advocacy has no place, in my opinion. It’s all about education for now. Final point re “responders” and “non-responders”. Because we don’t yet know who belongs to each group, I think it’s reckless and irresponsible to treat them all as potential responders. The prudent thing to do would be to assume the “worst case scenario”, that everyone is a non-responder who needs serious time and intense work and lots of practice. And then start from this point, and if a runner adapts faster, so be it, that’s good news. Instead, the media and advocates of barefoot running assume that everyone should make the switch because everyone will benefit. And the bodies left behind will be dealt with later. It’s just too aggressive, too extreme. And on this note, the media have propagated the myth far more even than the shoe companies like Vibram have. Vibram are trying to sell shoes, and so they make claims as part of marketing strategies to differentiate their product from their rivals’. That’s normal. And I can’t comment on the specifics of the lawsuit – maybe they’re guilty. But I do know that the media have done a poor job of providing education on this topic. With a few notable exceptions, they have allowed themselves to become a platform for the advocates of barefoot running without providing the necessary education. Lieberman’s paper illustrates this – he titled that research study “Foot strike patterns and collision forces in habitually barefoot versus shod runners“. The word “habitually” was in there for a reason. But when the media got hold of that study, they reported only that barefoot running was excellent because it reduced loading rates 7-fold. This study “proved” the benefit of barefoot running. Quickly, the “extremists” (my pet hate in all matters of sports science) jumped on this said “It proves our point” and the study’s other findings were lost in the aggressive or uninformed interpretation of the data. This is an eerily similar thing to what happens when it comes to dietary advice. Recently, I’ve been involved in debate back here in SA about paleo diets, low carb diets, high carb diets and the like. And once again, it’s a situation where people seem to become over-zealous, finding a cause for which they appoint themselves the spokesperson. Their success, which is either isolated (1 in 100) or common (1 in 2, perhaps, but never 100%) becomes their proof, and they start telling the world there is only one way to succeed. “Follow me to change your life” is the message, whether it’s barefoot running or eating like a caveman supposedly did. They thus make the mistake they accuse others of making, by lumping everyone into the same group. And here, those who succeed become loud, outspoken (and dare I say, obnoxious), whereas those who fail slink away into the background and remain quiet about their failure. So those who tried barefoot running and got injured disappear, those who succeeded often find a soapbox, write a book, and shout about it. Those who try low carbohydrate diets and fail revert back to routine with minimal fuss, whereas those who succeed feel the need to tell the world. They dismiss any research study finding that challenges their position as “corrupt”, “incompetent” and “garbage”, and so debate goes nowhere. Once again, this happens because of aggressive advocacy, when it should be about education. Which brings me to the final point. The big issue, I believe, is that people have become carried away with barefoot running as a way to treat injury and potentially improve performance without really appreciating how it might work (or, importantly, that it may not). What is the effect of other factors on the success of the ‘treatment’? For example, how does fatigue, terrain, muscle weakness, flexibility, strength etc impact on the success of the outcome? As a result of all of the above, we are in a very poor position to quantify the risks, and the “cost-benefit” of barefoot running. The point is, all the answers, which are pretty important, that you can read on the package insert when you get prescription medication, are unknown for barefoot running. Yet it is still prescribed ‘recklessly’. And for this, I completely blame the polarization of the debate that allows extremist views to develop and thrive. It’s perfect for the media and the ‘zealots’ who try to force their success on large groups of people without being open to the other side. And there are some who are more moderate – I apologize for lumping everyone together. But there are many who are not. They base their ‘prescription’ of barefoot running on their own success story, or at best, a group of runners who they have succeeded with, and suddenly, the entire running community is being told to take this “drug”. It works. Maybe. In some people. If they get it right. Possibly. That’s not good enough. And what’s worse is that when it doesn’t work, when they get injured, then it’s their fault. To return to the medication analogy, this is like giving a drug out to a sick patient and then hoping they get the dosage right. And even if they follow the instructions to the letter, they may fail, and then it’s their doing. They must have done something wrong. That’s not a viable drug. It’s not a viable “product”, and until that is recognized, I would caution all runners to be a little more prudent about how they advise others, and about following advice they receive. The golden rule in science should be that polarization should be regarded as highly suspicious. There are very few things that are known with absolute certainty, and when you’re dealing with incredibly complex human physiology, the individual differences that make us who we are, what we’re good at, how we run and what we eat, for example, are so vast and complex that nothing can be polarized without being wrong! So when someone says “It’s all about training, genes don’t matter”, they’re just as wrong as someone who says “It’s all about genes, training is irrelevant”. Similarly, barefoot running is not “the answer”, but nor is it bad. Carbohydrates are not evil, but nor are they the best option for some people, as evidence is now showing. An individual approach is the only accurate way to go – it’s not great for the media who love the sensation, and it’s not great news for the gold-diggers who want sensation to sell books, but that’s the reality. In a group of 100 runners, every single one will benefit from barefoot running as a training method. It changes muscle activation patterns, strengthens muscles and tendons that we don’t activate nearly as well in shoes, may be an effective form of rehabilitation, and it’s really enjoyable. So I would say that everyone should incorporate some barefoot running into their training programme. Whether it’s a 2 minute warm-up, an easy 30 min jog once a week, or some sprints after training, I’d say try it out and feel the difference it makes. However, it’s probably not for everyone. Practically, theoretically, logistically and for many other reasons, some people will not take to barefoot running well enough for them to become 100% barefoot runners. However, for others, it may well work. It may prove to be the answer to your prayers, and the secret to injury-free running for life. That’s fantastic, and so you should embrace it and do it with enjoyment. But don’t believe that because it helped you, it must be used in the same dosages by everyone else – they may not have the same “condition” as you, they may have an entirely different history and thus set of contra-indications, and your enthusiasm, however well intended, will cause more problems than it solves. You may sit on one of the poles – either north or south, either a responder and great barefoot runner, or a non-responder, and classic shod runner. Which is perfect for you, but remember, between those poles, there’s a world of people who are different, and so your extreme position in the complex spread of physiology shouldn’t produce an extreme advocate for anything.